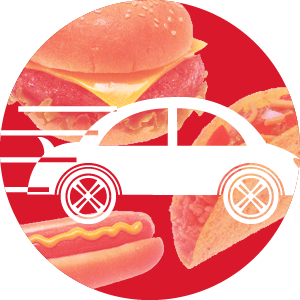 Let’s face it – fast food happens. We all eat it – some of us more than others. Did you know that while fast food might taste good to our taste buds – it doesn’t do much good for the rest of our body? So how can we have a win-win situation? How can we still get the best parts of fast food (taste, cost, convenience) and avoid the things that are bad for our health? Good news – there are lots of things you can choose to make your fast food more healthful. Read on for healthy ideas. Did you know that you can save calories, sodium, AND money by choosing water instead of soda! If you drink even $1 worth of soda every day, you could save an extra $30 per month or $360 a year by switching to water! Salt or sodium is hidden in many foods. You can say NO to the salt shaker and even better, you can also ask for your food to be prepared with no added salt. That’s right – you have the power to order your food how you like it, so speak up and ask for low salt food. Bigger isn’t always better! If you can choose a smaller meal, you’re getting less fat, fewer calories, and less sodium! It’s that simple. So try to choose a ‘kids size’ or look for words like ‘mini’ and ‘junior’ when ordering. We don’t mean on the couch! You can veg out by adding extra veggies to your fast food meals. Think about how many veggies you could get by asking for veggie pizza, veggie burrito, veggies on your burger, veggies in your sub sandwich. Anytime you can ask for extra lettuce, tomato, onion, peppers, (etc) you are filling your body with healthy vitamins and minerals. Sauces, dips, and condiments are notorious for being high in salt and calories. Anytime you have the option, ask for the sauce, dressing, or condiment on the side. That way, you have control over how much you add – you have the power to choose fewer calories and salt this way. Check out our food glossary for more info about cooking and food preparation methods. And who said that fast food has to come from a restaurant anyway? You can make your own fast food at home. Healthy meals that you can prepare ahead of time, meals you can put in the crockpot, or using leftovers that you cooked another day can all make for fast food that is much healthier for your family than what a restaurant can provide. 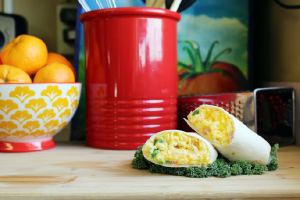 Try our breakfast burritos for an example of a healthy fast food you can make at home – your whole family will love them.